Cleveland rocks for sports collectors! 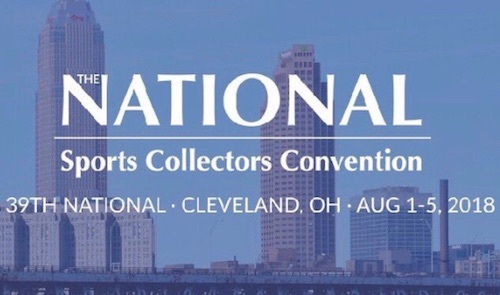 The 2018 National Sports Collectors Convention calls Ohio home for the 39th annual mega-event. No matter what it is that you collect, the sprawling NSCC is very likely to have some (or lots) available for you to peruse and take home. Plus, it gives many the chance to meet up with their collecting friends. And you can't forget the many in-person signers, exclusive cards and hobby events taking place in "the Cleve" at the beginning of August. While sports collectible shows may seem like a thing of the past, there are actually quite a few going on throughout the year and in many different regions. However, the 2018 National Sports Collectors Convention stands above the rest based on the sheer size of the event and the exposure from the rest of the collecting world. Looking ahead, after Chicago hosted the 2017 National, it gets the call again in 2019. Following that, in 2020, it's Atlantic City, which was also the site for 2016. As there is a lot to see and do, it can be an overwhelming experience, especially for first-timers. With that in mind, be sure to check out our National Sports Collectors Convention Survival Guide so you know what to expect and how to prepare. Where is it? : International Exposition Center (I-X Center) in Cleveland, Ohio. See complete directions and parking info for the I-X Center as well as the NSCC schedule of events. The National site also provides discounted hotel rooms and rates if you book ahead. If you like to be able to see exactly where you are going, review a detailed Google map for the area around the 2018 National Sports Collectors Convention below. Obviously, you need a ticket to get into the 2018 National Sports Collectors Convention. If you want the most basic option, it's $19 per day if pre-purchased (or $22/day at the show), and don't forget that kids 12 and under get in free for the entire event. There are also more expensive packages which come with extra perks, so you have to decide what works best for you. In addition to exclusive freebies and show admission for all five days, VIP tickets offer free autographs, as well. The main VIP package is good for 12 autographs from a designated group, while the Super VIP includes all 18 signers. The Super VIP also features a free hat, double the VIP cards, and free parking in a special parking lot, so that might be especially appealing for some. Even more expensive, the All-Access packages match the VIP perks and have first-in-line privileges. Collectors can get a better price on most ticket options by purchasing before they get to the show. Full details for the 2018 National Sports Collectors Convention ticket pricing and packages can be viewed on the National's website. 2018 NSCC admission tickets officially go on sale Monday, March 5. Topps is also having its annual VIP party for VIP ticket holders. This gets going at 2:30 PM on Wednesday and includes free autographs from Calvin Murphy (NBA Hall of Fame), Mike Hargrove (former Cleveland Indians Manager), and Luis Tiant (former Cleveland Indians pitcher). Another fun aspect of the 2018 National Sports Collectors Convention being in Cleveland is that collectors can explore the city. If you are looking for something else to do in addition to the NSCC festivities, there are several options. Baseball fans are in luck as the Los Angeles Angels are in town to play the Cleveland Indians on August 3, 4 and 5. 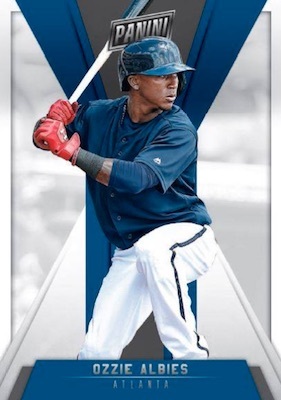 In fact, the Sunday game has a giveaway for a Topps promo set. Another sports-based option nearby, the WGC Bridgestone Invitational about 40 miles away in Akron features some of the top golfers in the world, including Dustin Johnson, Rory McIlroy, Justin Rose, Tiger Woods, Jordan Spieth, Rickie Fowler, Jason Day and Bubba Watson. It is also worth noting that the 2018 Pro Football Hall of Fame enshrinement is the same weekend in Canton, Ohio, which is only around 60 miles away. The actual Hall of Fame game between the Chicago Bears and the Baltimore Ravens is on August 2. 2017 DESHAUN WATSON National Convention Rookie Rapture Patch Card #'d 38 49 !!!! The TriStar Autograph Pavilion is a top draw at the 2018 National Sports Collectors Convention. While most autographs cost extra, this is where the VIP tickets can be used for free autographs from a select group. The tentative 2018 NSCC signers list schedule is shown below. Please note that all signers are subject to change. The TriStar website has full information posted, including specific prices, signing times and details on ticket sales. Late changes to the schedule are compiled here. *VIP guests are noted below. **Hargrove, Petrocelli, Tiant and Calvin Murphy signing free during Sneak Peak on Wednesday. Subject to change. * Notes VIPs, ** Notes free Sneak Peek signers. The NSCC is also a haven for card collectors, with many 2018 National Sports Collectors Convention exclusives available. Most of the brands offer special cards as part of the VIP ticket package for the event. In addition, there are more exclusives at the company booths, mainly wrapper redemption programs, which provide even more of a selection. Complete details for each company will be listed here as info is revealed. 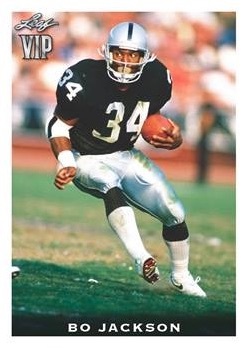 Panini is the first to release their VIP card lineup. The multi-sport set totals 10 cards from recent or upcoming baseball, basketball and football rookies. Each VIP receives the full set. Panini also announced a surprise Charles Barkley Tribute set in honor of his recent autograph deal with the company. The 10-card lineup, limited to 399 copies apiece, covers his college and pro career with numbered parallels (199 or less) and even autographs. 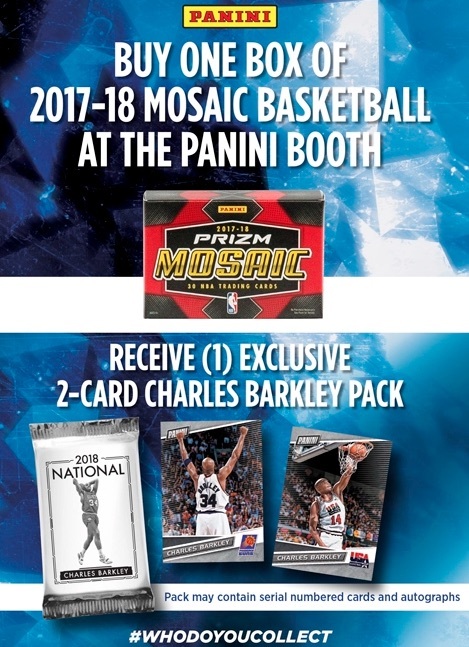 The two-card packs are earned by purchasing 2017-18 Mosaic Prizm Basketball boxes at the Panini booth. In addition, Panini adds exclusive sets for those at the convention. That includes the silver foil NSCC packs and the special gold foil VIP party packs. 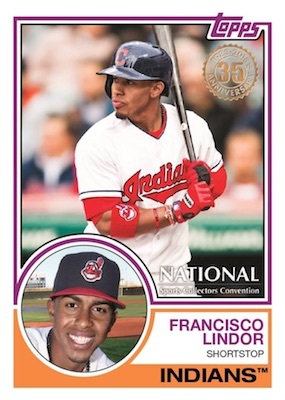 For the 2018 Topps National VIP set, it's all local MLB favorites from the Cleveland Indians. The five-card lineup uses the 1983 design with notations for the 35th anniversary of the product and the National Sports Collectors Convention logo. 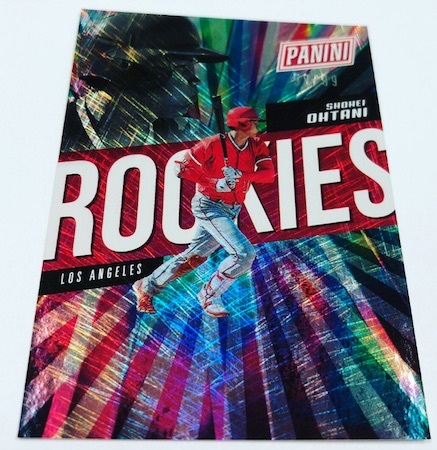 Topps also has their NSCC wrapper redemption program featuring the 2018 Bowman Chrome design. The 50-card set is joined by limited autographs for many of the subjects. 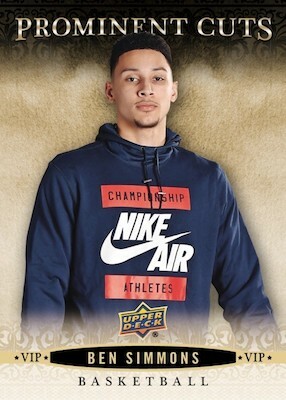 For the VIP ticket-holders, Upper Deck has a five-card set honoring some of their biggest exclusives from basketball, tennis and golf. The full Gold VIP Prominent Cuts base set is issued for each VIP. 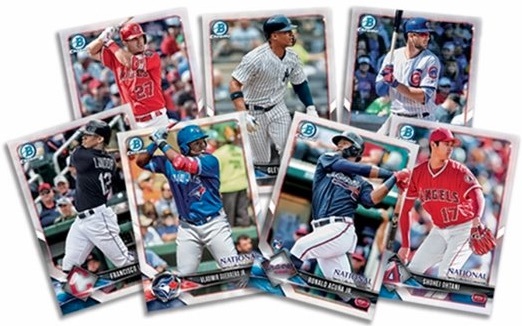 Distributed to those who make specific UD purchases through an Upper Deck Certified Diamond Dealer at the National, there is also a 2018 Upper Deck NSCC Wrapper Redemption set featuring Prominent Cuts and Top Shelf Rookies cards. These have limited signed versions, as well. A special case break promotion takes that up another level with more exclusive cards. Finally, there is the Legend of Cleveland promo awarded to those who purchase five 2017-18 UD Hobby packs at the show. 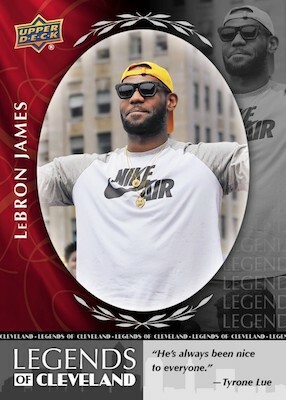 Highlighting LeBron James, collectors receive two LBJ cards. 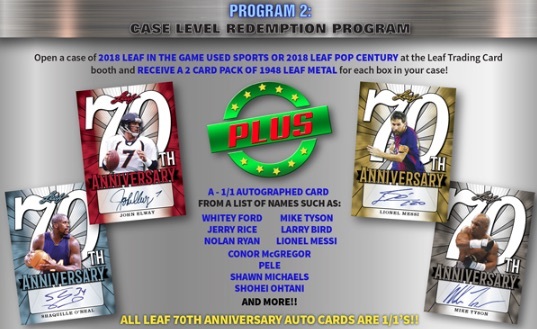 Leaf joins the fun with their own VIP set featuring past stars of the gridiron, diamond and court. 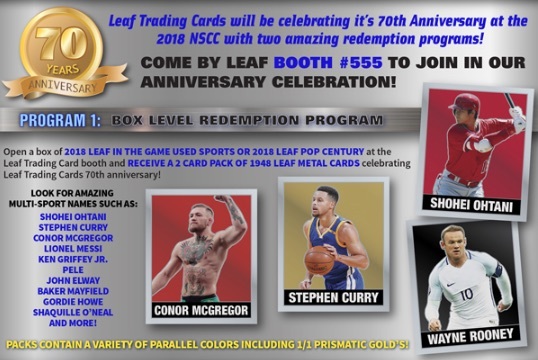 In addition to the four-card VIP set, the 39-card Leaf 2018 NSCC National Promo set is found only at their booth (#555). 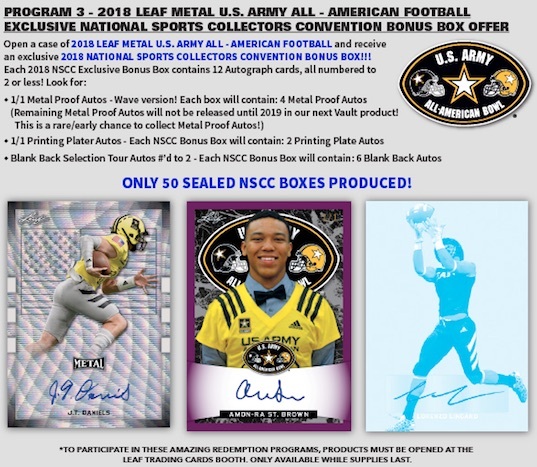 For those looking to bust some wax, Leaf has a wrapper redemption program centered around specific purchases of 2018 Leaf Pop Century Metal, 2018 Leaf In the Game Used and 2018 Leaf Metal US Army All-American Football. (5) Card 2018 Leaf Shohei Ohtani COMPLETE ROOKIE RC SET NATIONAL VIP SET MINT! Why always Cleveland or Chicago etc. maybe Dallas? I am in the market to sale my collection of baseball Memoriabilia. Most of the items,I have have been packaged and never opened. Length time is anywhere from 18+ years to 30 years. Also have a collection of 15000+ baseball,football,hockey,basketball cards, more baseball then anything, in mint conditions.Also have a good collection of model cars and trucks, some very antique and some in box that have never been opened. As noted in the guide, TriStar will post the full schedule as the event gets closer. I have a couple pieces, one card, one photo that are autographed sans-COA. Will there be authenticators or anyone at this event who can confirm what I have is genuine? All the major authenticators will be there. I would like to know how many former professional athletes will be at the 2018 National Sports Collectors Convention on Sunday August 5. Thank you. It is listed on the tab for Autograph guests on Sunday, August 5.